Paris, collection of Berthélemy Augustin Blondel d’Azincourt (1719-1794; general treasurer of the Caisse des amortissements, supervisor of the Menus-plaisirs du Roi). His sale, Paris, April 18ff, 1770, lot 23: “Un sujet composé de dix Amours, dont un éguise sa fléche; le fond est un paysage. Ce Tableau très agréable, et qui a beaucoup de mérite, est peint sur bois par Antoine Watteau: il porte 4 pouces 9 lignes de haut, sur 6 pouces de large.” It sold for 130.1 livres. According to an annotated copy of the catalogue in the Doucet Library, it sold to “Lebrun père,” meaning Pierre Lebrun (c. 1700-1771; artist). The annotated catalogue in the Rijksbureau voor Kunsthistorische Documentatie is marked simply “Lebrun,” which normally would refer to Pierre’s son, Jean-Baptiste Pierre Lebrun (1748-1813, painter and art dealer), who in his long career handled many Watteau paintings. Perhaps at this moment, the father's and son’s business arrangements were linked together. Gabriel de Saint Aubin, Sketches of L'Amour aiguisant ses traits by Watteau (left) and the Soldats près d’une tour by Pater (right) in the 1777 auction of the prince de Conti‘s collection. Paris, Bibliothèque nationale de France, Cabinet des estampes. Paris, collection of Louis François de Bourbon, prince de Conti (1717-1776). His sale, Paris, April 8-June 6, 1777, lot 666: “[Antoine Watteau.] Deux autres bons tableaux sur bois, chacun de 5 pouces de haut sur 6 pouces de large; dans l’un on voit des Amours qui aiguisent leur fleches pour tirer sur un coeur; dans l’autre des soldats sont près d’une tour.“ According to an annotated catalogue in the Bibliothèque nationale, the lot sold for 251 livres to Léraut, L’heraud, or Lerau, depending on which of the several annotated copies of the catalogue one consults. (Adhémar incorrectly reported that the buyer was “Cheraud.”) Léraut was supposedly an “ingénieur” who bought heavily at the sale. Gabriel de Saint Aubin attended the sale and, as was his custom, drew a small sketch of the two pendants. With concentration, one can recognize the major lines of the extant version of L’Amour aiguisant ses traits. Regarding the pendant picture, see below under Remarks. Paris, collection of Charles Paul Jean-Baptiste de Bourgevin Vialart, comte de Saint-Morys (or Saint-Maurice) (1743-1795; mosquetaire, conseiller au Parlement). His sale, Paris, February 6-23, 1786, lot 40: “A. WATTEAU . . . Un petit Tableau, représentant un Paysage, dans lequel sont plusieurs Amours occupés à tendre leur arc, tandis que d’autres aiguisent leurs fleches. Ce joli morceau, qui a toujours tenu une place distinguée dans les Collections, est dessiné & touché avec beaucoup d’esprit. Hauteur 4 pouces 6 lignes, largeur 6 pouces. B. Nota. Il peut servir de pendant au Tableau de Callot. No. 33.” The picture supposedly sold for 100 livres to Robert Quesney (written variously as “Quenet” and “Quesnet”), probably an art dealer. The selling price and buyer’s name are recorded in annotated copies of the catalogue in the British Museum, the Rijksbureau voor Kunsthistorische Documentatie, and the Bibliothèque nationale. Yet since the painting reappeared on the market just two months later, the supposed sale may have been another machination of the auction system. Paris, sale of M. Morel and others, Paris, May 3ff, 1786 (postponed from April 19ff, 1786), lot 144: ”PAR LE MÊME [ANTOINE WATTEAU] . . . Un petit Tableau Paysage, sur le devant duquel sont différent grouppes d’amours occupés à aiguiser leurs fleches, & d’autres à viser à un coeur placé sur un arbre; ce Tableau joint à une grande finesse & fraîcheur de couleur, une correction de dessin qui ne doit laisser aucun doute sur son originalité, ainsi que nous l’annonçons. Hauteur 4 pouces & demi, largeur 6 pouces. B.” The short time between the preceding sale and this—just two months—makes it unlikely that the painting had been in Morel’s collection. As this was a vente composé, the painting was probably one of those added to Morel’s sale. According to annotated copies of the sale catalogue in the Rijksbureau voor Kunsthistorische Documentatie, the Bibliothèque nationale, and elsewhere, the painting sold to Vincent Michel Maynon de Farcheville (recorded as "de Mernon," "de Mesnons," and "Maynon" in various sale catalogues) for 121 livres. At this sale Maynon also acquired lot 143, Watteau’s Les Jaloux, for 129 livres, in other words, for approximately the same price. Paris, collection of Vincent Michel Maynon de Farcheville (c. 1716-c. 1805; Président au Parlement en la quatrième chambre des enquêtes, seigneur de Châtillon, Cernay, Puiselet le Marais, baron de Bouville, etc.). His sale, Paris, April 28-May 5, 1806, lot 37: “VATTEAU (Ant.) . . . Groupes d’Amours, petit Tableau.” Sold for 20.05 francs. Paris, collection of Robert de Saint Victor. His sale, November 26, 1822-January 7, 1823, lot 572: “PAR LE MÊME [WATTEAU] . . . Dans un Paysage, on voit nombre de petits amours, dont un lance sa fleche, tandis que l’autre aiguise la sienne sur une pierre. B. l. 6 p. h. 5 p." The painting sold for 20 francs. Paris, collection of the comtesse de Looz. Her sale, Paris, June 21ff, 1825, lot 142: “VATTEAU . . . Dans un Paysage, on voit nombre de petits Amours livrés à divers amusemens: l’un d’eux lance sa flêche, tandis que l’autre aiguise la sienne sur une Pierre. B. l. 6 p., h. 5 p.” According to an annotated copy of the catalogue in the British Museum, the picture was sold to Payen, an otherwise unidentified buyer, active from at least 1814 onward. Paris, collection of Daniel Saint (1778-1847; miniaturist). His sale, May 4-7 and 11-14, 1846, lot 69: “DU MÊME [WATTEAU (Antoine)] . . . L’Amour entouré de jeunes enfants ailés, et aiguisant ses traits. Petit tableau d’une grande finesse de ton.” The picture sold for 110 francs according to annotated copies of the catalogue in the Rijksbureau voor Kunsthistorische Documentatie and the Frick Art Reference Library. Paris, collection of François-Simon-Alphonse Giroux (c. 1775-1848; art restorer, ébeniste). His sale, Paris, February 10-12, 1851, lot 197: “DU MÊME [WATTEAU (ANTOINE)] . . . L’Amour entouré de jeunes enfants ailés, dont plusieurs à droite aiguisent ses traits, d’autres lancent des flèches. Petit tableau d’une grande finesse de ton. T.—Hauteur, 13 cent. Largeur, 18 cent.” According to annotated copies of the catalogue in the Bibliothèque nationale and the Frick Art Reference Library, the picture sold for 505 francs. The earliest references to our painting identified it as on panel; none of the nineteenth-century references specified the support before this one, where it is described as on canvas. Louveciennes, collection of Raymond Bodel. The picture passed by inheritance to Mme. France Bodel who, in turn, sold it to Wildenstein and Co.
New York, Wildenstein and Co.
New York, Sotheby’s, June 6, 2012, lot 55: “JEAN ANTOINE WATTEAU . . . CUPID’S REALM (LE ROYAUME DE L’AMOUR / oil on canvas / 5 1/8 by 7 in. ; 13 by 17.8 cm. / $200,000-300,000 €153,000-229,000 £124,000-186,000 / PROVENANCE . . . EXHIBITED . . . LITERATURE . . . / In this whimsical representation of Cupid’s Realm, the young Watteau reveals his own formidable skills as a painter as well as his debt to his teacher, Claude Gillot. 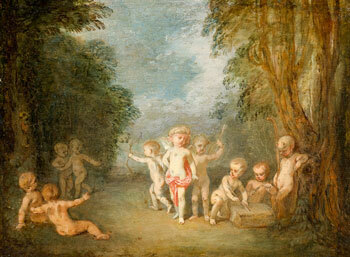 Set in a small clearing in the woods, the painting shows a group of putti and a young satyr, his horns still mere nubs at the top of his head. At the left, four putti watch a companion shooting arrows at a heart-shaped target hanging from the trunk of a tree, while at the right, another group of putti sharpens their arrows while the satyr looks on. In the center is Cupid himself, his bouffant curls restrained by a pink ribbon, while a swath of the same material is looped around his loins. The composition and the figures, with their elongated bodies and over-large heads, show the strong influence of Gillot while the subject matter and handling are equally characteristic of Watteau’s own early works. The figures are painted with a fine brush in short quick strokes using a thick, fatty paint; the main elements of the background are treated similarly. The foliage, however, is more lightly drawn, in a thinner paint, as are the dark accents on the bark of the trees. 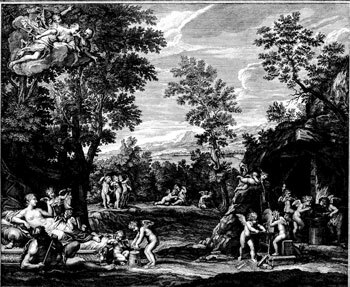 Cupid’s Realm can be compared to the Pilgrimage to the Island of Cythera of about 1710, in the Städelsches Institut, Frankfurt. While the main focus of the Frankfurt painting is the elegant couples about to take a barque to Cythera, their boatmen are all putti—brothers to the figures in the present work—one even has a quiver of arrows. The same free style that characterizes Cupid’s Realm is also evident in the Frankfurt picture. The subject here, with its vignettes of sharpening arrows and shooting at targets may have derived from the paintings of Francesco Albani, who was an important influence in France during the period. . . . Although the provenance of Cupid’s Realm goes back to the mid-eighteenth century, the painting had disappeared from Watteau’s published oeuvre for more than 150 years when Martin Eidelberg rediscovered it in 1999 . . . . Its 'disappearance' was due in part to the fact that it was inaccurately described in most of the early catalogues. Until 1851, the medium was recorded as oil on panel in all but one of the auction catalogues, making it difficult to relate those entries to the present work. Adding to the confusion, the description of the subject matter was often imprecise, with the result that Cupid’s Realm was frequently referred to as the Island of Cythera, thus suggesting the Frankfurt picture or later versions of the same subject. It was primarily the consistency in the measurements of this unusually small work that enabled Eidelberg to trace the distinguished history of this charming painting and bring it back into the body of Watteau’s oeuvre. . . .” Sold for $206,500 to a private American collector. New York, Wildenstein, Arts of France (2006), cat. 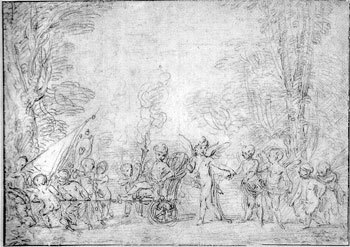 41 (as Watteau, Cupid’s Realm [Le Royaume de l’Amour], lent by Wildenstein and Co.). Hédouin, Mosaïque (1856), cat. 151. Goncourt, Catalogue raisonné (1875), 51. Dacier, Vuaflart, and Hérold, Jean de Jullienne et les graveurs (1921-29), under cat. 181. Réau, “Watteau” (1928), cat. 14. Adhémar, Watteau (1950), cat. 147. Lévy, "Watteau et Le Moyne" (1958), 351-54. Macchia and Montagni, L’opera completa di Watteau (1968), cat. 100. Eidelberg, “Ce joli morceau” (1999), 39-46. Roland Michel, “Un «maître» et ses élèves” (2001), 395-96. This was an essentially unknown composition until 1999. Hédouin knew it from the Saint collection, assigned it a proper catalogue number, and titled it L'Amour aiguisant ses traits. Edmond de Goncourt noted that it had passed in two Paris sales, but he did not even assign it a proper catalogue number. Dacier, Vuaflart, and Hérod cited many of the sales of this painting in the eighteenth and nineteenth centuries, but wrongly thought that they referred to Les Amusements de Cythère. Réau merely followed de Goncourt’s lead, and Adhémar did the same, adding several additional references but not without errors. Not only had all these scholars overlooked the picture’s remarkably long and essentially continuous provenance, stretching as it does from 1770 to 1851, and, even more important, no twentieth-century scholar suspected that the painting was still extant and in good condition. In 1999 I erred by including in L’Amour aiguisant ses traits's provenance a Watteau painting that appeared in an anonymous Parisian sale on June 1774, lot 134: “Un petit Paysage, où l’on voit plusieurs enfans qui jouent.” While the measurements of that painting (4 1/2 by 6 1/2 pouces) accord with L’Amour aiguisant ses traits, it was on canvas rather than on panel, and it lacked the faux pendant that accompanied our painting in 1770 and 1777. In short, the painting sold in 1774 must be a different Watteau composition. When L’Amour aiguisant ses traits was presented at auction in 1770, the following lot was a painting by Pater showing troops on the march (“un départ de troupes”). It too was on panel and was small in scale like L’Amour aiguisant ses traits, measuring 6 pouces 3 lignes by 8 pouces. That is only two pouces larger in each direction, a relatively insignificant difference. The Pater was not announced as a pendant to L’Amour aiguisant ses traits, and the themes of the two paintings have nothing in common: nonetheless, I believe that the pair were hung together in d’Azincourt’s collection. At the sale, the two paintings were offered independently and, in fact, the Pater was supposedly sold to a different buyer, someone identified as M. Le Prieur. Curiously, when L’Amour aiguisant ses traits reappeared at auction just seven years later, in 1777, it was again coupled with a military subject (“soldats près d’un tour”). I believe it probable, that this was the same faux pendant as before. The descriptions of the two paintings allow the possibility that they were the same composition, one that like Watteau’s Le Départ de garnison shows troops leaving a town by its fortified tower gate. Something of this is suggested in the sketch made by Saint Aubin at the 1777 sale. A major difference is that whereas in 1770 this second painting was ascribed to Pater and was listed as being slightly larger, in the 1777 sale it passed under Watteau’s name and the catalogue implied that it had the same dimensions as L’Amour aiguisant ses traits. These, I believe, are sleights of hand not uncommon in the marketplace. Unfortunately, it has not yet been possible to identify the military composition among Pater’s pictures. In contrast, some scholars have accepted Soldats près d’un tour as a painting by Watteau, and since there is no other reference to it in eighteenth-century sales, they have catalogued it as a lost work. As a coda to this narrative of faux pendants, when L’Amour aiguisant ses traits came up for sale in February 1786, it was shorn of its military pendant but a note at the end of the catalogue entry suggested that a Callot painting in the same sale could be used as a pendant. 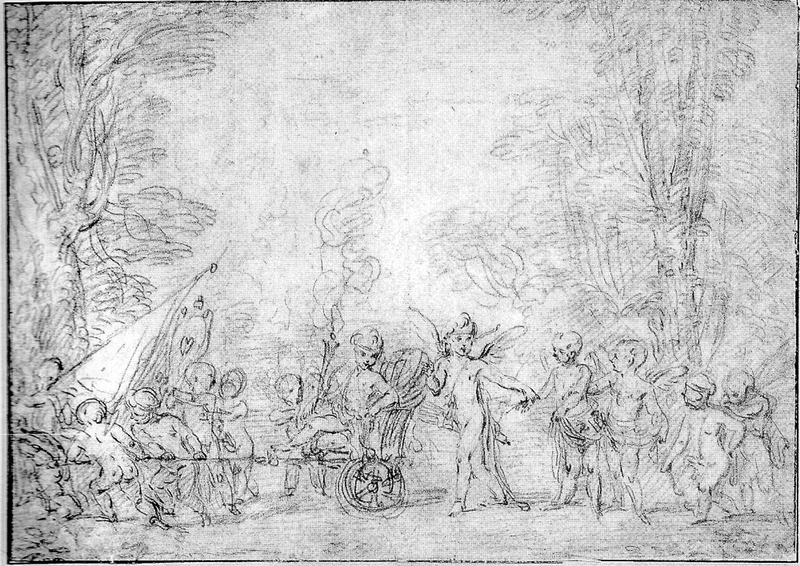 Watteau, Cupid’s Cortege, red chalk, 15 x 21 cm. Switzerland, private collection. Although no drawings directly relate to this painting, there are some whose stylistic and thematic analogies are significant. Perhaps the most striking is a compositional study in a private Swiss collection (Rosenberg and Prat 14) that shows putti parodying a triumphal procession. A young child seated in a chariot drawn by putti holds aloft a lit torch, indicating that this celebrates a wedding. Cupid walks behind the chariot and grasps the wrist of another child, who is also guided forward by a winged, possibly female cherub. If this drawing had led to a painting, that work could have served as a pendant to L'Amour aiguisant ses traits. Not only are the two compositions related visually and thematically, but both are of the same creative moment. The figures of Cupid in both are nearly identical. This painting definitely stems from Watteau’s early career (Rosenberg and Prat date the drawing to c. 1709). Indeed, elements such as the overly large heads recall Gillot’s manner. Also, this theoretically classical but not terribly serious treatment of mythological themes accords with Gillot’s parodic tendencies. The child satyr at the far right of the painting, a personage not traditionally found in such scenes with Cupid, is another indication of Gillot’s influence. On the other hand, the rich, painterly treatment and charming overall spirit conjure up Watteau’s L’Ile de Cythère, now in Frankfurt. Because the painting hovers between Watteau’s and Gillot’s manners and might have had a pendant, it is tempting to consider two more candidates for pendants that were sold from the comtesse de Verrue’s collection in 1737, just sixteen years after Watteau’s death: “Deux Tableaux de Gillot ou Vatteau.” At the least, one can appreciate how even Watteau’s contemporaries sometimes waffled in trying to distinguish between master and pupil. Critics tend to overlook the importance of traditional classical subject matter in Watteau’s career, especially in his earliest years. Before he became established as a painter of fêtes galantes, he often turned to these established themes, both in response to the demands of the marketplace and a deference to his training under Gillot and Audran. Such motives help account for the classical narratives of so many of his paintings, such as Les Amusements de Cythère and L’Amour mal accompagné. L'Amour aiguisant ses traits contains two related but separate themes: cupids shooting at a target and cupids sharpening their arrows on a grindstone. The former subject has a prestigious ancestry, as in one of Raphael’s frescoes in the Villa Farnesina and in the works of Giorgio Vasari and Annibale Carracci. Benoît 1er Audran after Francesco Albani, Venus at Vulcan’s Forge, engraving. Paris, Bibliothèque nationale de France, Cabinet des estampes. Most important, the two themes of putti shooting at a target and putti sharpening their arrows were juxtaposed by Francesco Albani in several paintings, most notably an Allegory of Fire, one of four tondi in the Villa Borghese, and in Venus at Vulcan’s Forge, one of four rectangular compositions in the Palazzo Falconieri. Both versions were widely admired and circulated through copies and engravings. The Falconieri version was twice engraved, first in Rome by Étienne Baudet and then in Paris by Benoît 1er Audran after the painting entered the collection of Louis XIV. Although Watteau’s composition is quite different from Albani’s, still there are interesting points of correspondence, such as the juxtaposition of a cupid sharpening the point of his arrow while his companion tests another arrow on his finger. Likewise, both artists shift the scene of shooting deeper in space, although Albani positioned the scene much farther back. That Watteau was attracted to Albani’s composition is also suggested in his painting Les Amusements de Cythère, a composition that was similarly inspired by Albani’s inventions.